If you’re looking for work-appropriate pants, I’m loving the Tory Burch pair above, but also this Elie Tahari pair. He always creates the most elegant and flattering silhouettes! Still drooling over this Stella McCartney bag. Isn’t she a beaut? There’s nothing I love more this time of year than an oversized sweater. Pair it with leggings and over-the-knee boots for a comfy, cozy, but totally chic look. This chevron scarf is the ideal layering piece for these mild fall days… and it’s under $40, so why wait? A tailored peacoat for under $100? Yes, please! How fab are these velvet ankle-strap pumps? Obsessed. If you’re loving navy for a cocktail dress, check out my post from last week on wedding attire! Oh what a classic looking assortment! Oh I love navy blue during fall. Great pieces! Love navy so this edit is perfect for me! I think navy might be my favorite color. I want it all! Those polka dot pjs are the absolute cutest!! I’m a sucker for navy, my whole house is navy and white!! That sweater is amazing with the gold hardware! Gorgeous picks. Love the accessories. Those are some of the most interesting shoes I’ve ever seen (number 13), but I actually really love them! I really like 5,6 and 8. I’m not a huge navy person, but I do adore the color navy. I like it with blush and gray best. 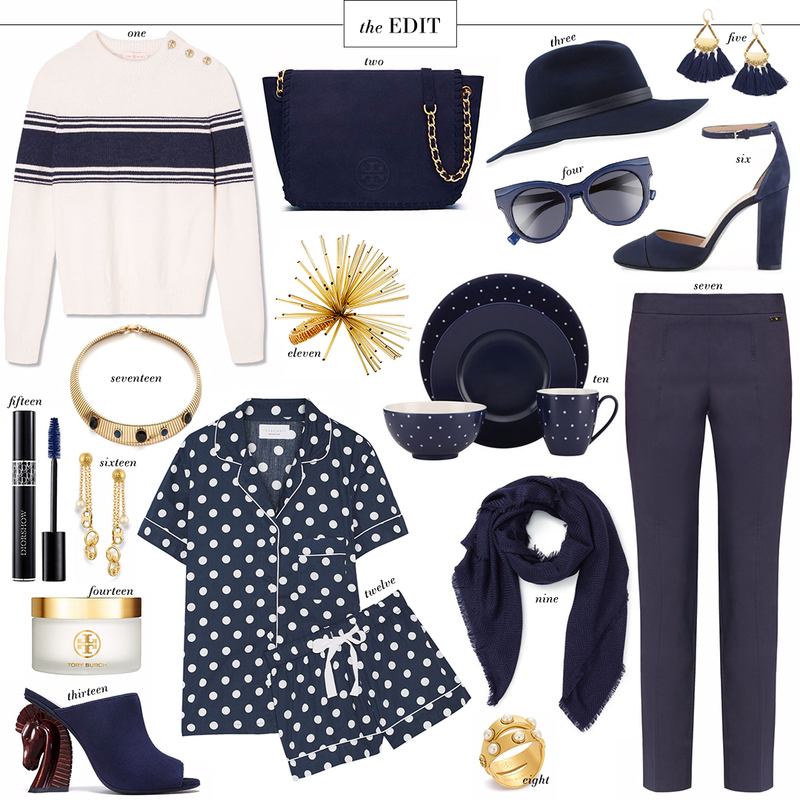 you won’t regret adding navy to your wardrobe! i’m all about it these days!! do it merritt! There is something about navy and white that is so classy and polished. I’m loving that scarf especially. Navy & black is one of my favorite pairings. I actually posted about it today. If I were going to purchase one navy item, it would be either a cashmere sweater or a boyfriend blazer. Endless possibilities!